A Pavillion couple has reached a settlement with Encana Corp. over contaminated groundwater in the central Wyoming gas field where they live. The confidential agreement marks an end to the last legal battle in the debate over whether development of the Pavillion gas field polluted the water outside of a tiny town on the Wind River Reservation. Jeff and Rhonda Locker brought the suit against Encana in 2014, arguing that the firm polluted their water and then lied about it. The company has robustly denied the allegations. The Lockers said the settlement does not mean the water pollution is resolved for local residents. A lawyer for the family said the settlement, brokered by former governor Mike Sullivan, was encouragingly amicable. All parties were “respectful” of one another, he said. Pavillion garnered national attention after the Environmental Protection Agency published a draft report in 2011 linking contamination of shallow-depth water wells with wastewater pits. The report also linked hydraulic fracturing to pollution of the drinking water aquifer, suggesting that well casing inadequacies and fracking had allowed contaminates from frack fluids to migrate up into the water. Fracking was unleashing a boom of activity in the oil and gas fields in Wyoming and across the country at the time. It is a common practice today for most wells drilled in the state and has allowed companies to reach previously inaccessible oil and gas deposits. 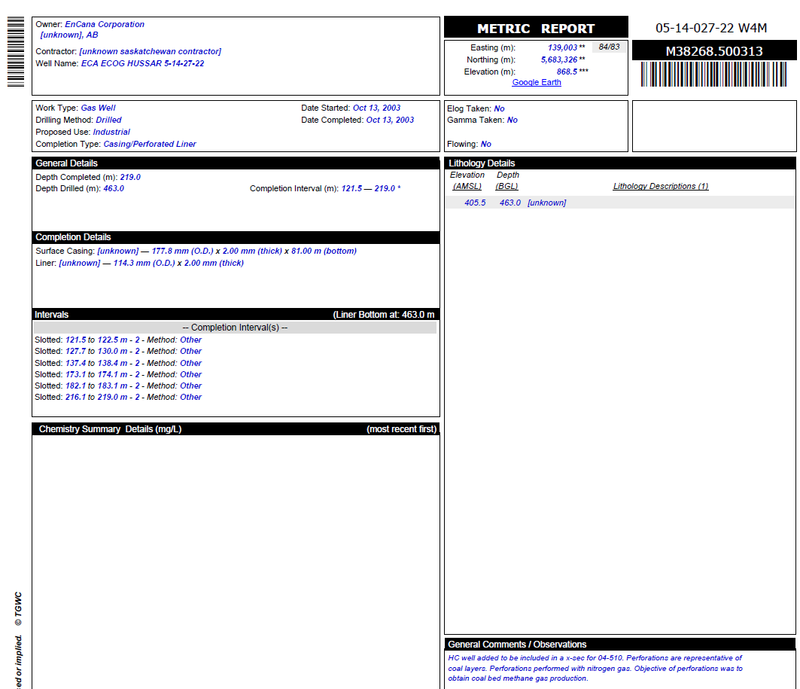 The EPA report was ill-received in Wyoming. Gov. Matt Mead said in an interview with the Star-Tribune at the time that the federal results were premature. [Encana paid for, controlled and with enabling] Wyoming regulators took over the EPA’s investigation in 2013, narrowing its scope. The state said its approach, which included less field study, was more systematic. Encana donated $1 million to provide water cisterns to impacted residents and fund the state study. 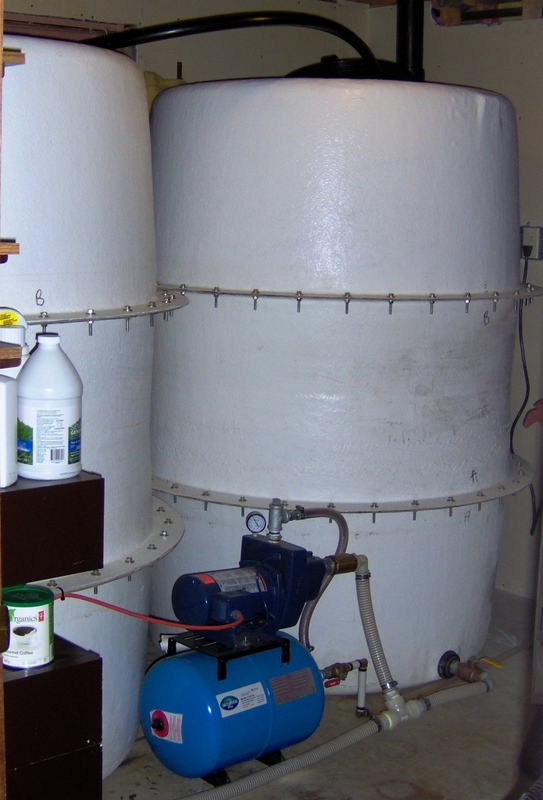 [2012 Reality Check: The state funded the cisterns. A final report [funded and controlled by Encana] from state regulators published in 2016 disputed the EPA’s findings. It said that without baseline water testing prior to oil and gas activities, contaminants found in well water could not be directly linked to industry. It criticized some of the practices by EPA used in its determination, like the materials used in EPA’s own monitoring wells. The unpalatable drinking water outside the town of Pavillion may be a result of existing contaminants and naturally occurring substances, according to the state. Local landowners, and the landowner advocacy group Powder River Basin Resource Council, believe the Environmental Protection Agency’s investigation was sound [The US Geological Survey affirmed the EPA’s investigation and results, reference listed below] and the state’s determination inadequate. They continue to push for remediation in the area as Encana and regulators proceed with plugging wells. The Resource Council and the Pavillion Area Concerned Citizens recently noted corroded casing and high pressure in the wells being plugged in letters to the Bureau of Land Management and the Wyoming Oil and Gas Conservation Commission. Wyoming regulators from the Department of Environmental Quality and the Oil and Gas Conservation Commission continue to work in the Pavillion area. The Oil and Gas Conservation Commission has never fined Encana for the issues found in investigating Pavillion’s water contamination. 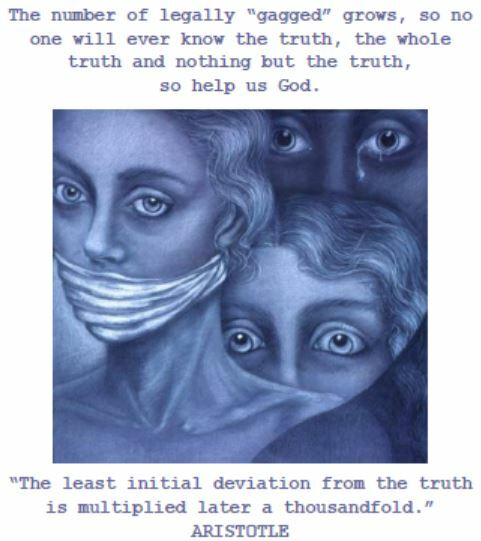 Slide compiled from Ernst research and speaking events. What do oil companies least like to do? The commission changed its water testing rules in 2015. It now requires companies to do water sampling before and after oil and gas operations. Locker said the baseline water testing was one step forward for the state, and that he hoped Wyoming had learned from what happened to Pavillion. [Did part of the settlement include Lockers shilling for the pollution-enabling State of Wyoming? Why else are they “talking” to the media after gagging with Encana? Why speak such synergized foolishness? When there is baseline water testing proving the contamination is industry’s, the regulators change the historic data to let the polluters get away with it, and hang the harmed families and aquifers out to dry. Ernst and others in Alberta with drinking water contaminated by Encana’s law violations and hydraulic fracturing have baseline and or historic water well tests or both showing no gases present before Encana broke the law and contaminated the aquifers supplying those water wells. 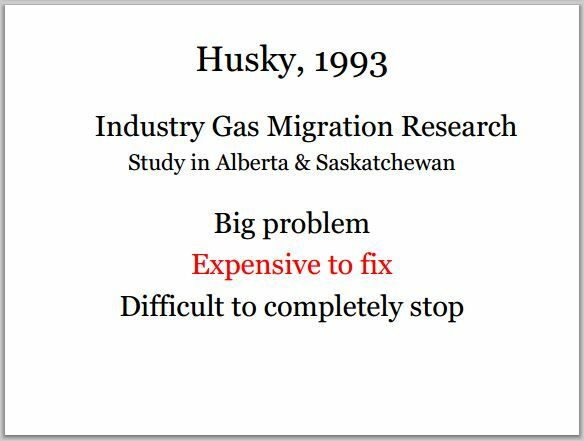 Instead of heeding the pre-frac tests, even those completed by Encana, Encana, regulators and “experts” just make up whatever they want about the historic and baseline records and say there was always gas present. Expert Dr. Alexander Blyth even fabricated historic records in official reports that the research agency he worked for refused to disclose after being ordered to in official judicial inquiry. 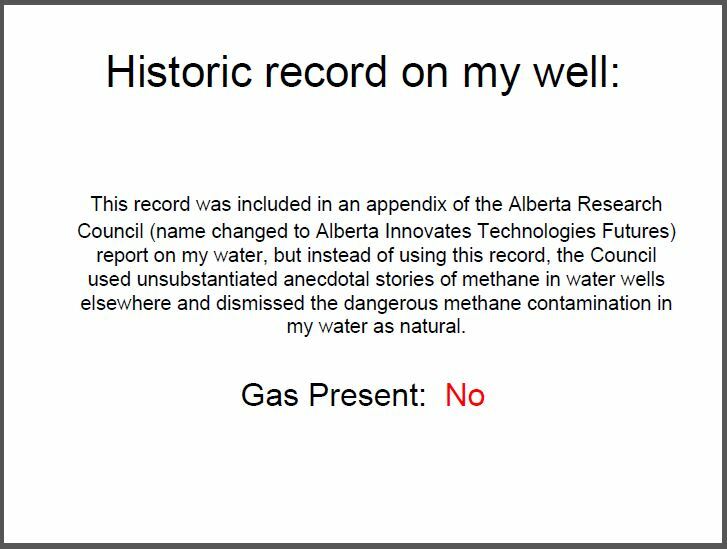 After numerous Albertans with historic water well tests showing no gas present before frac’ing publicly spoke up about their gas contaminated drinking water after nearby frac’ing, the Alberta government removed all the historic records that say Gas Present: No and replaced them with completely new made up “history” records that are now blank for gas present or not. Wyoming needs to be “forward thinking” in regard to its regulations, he said, noting landowner water concerns in Laramie County where companies have recently applied for water injection wells. RIVERTON, Wyo. (AP) — A Wyoming couple has filed notice that they have reached a settlement in their lawsuit against Encana Oil & Gas over potentially tainted groundwater. Pavillion-area couple Jeff and Rhonda Locker filed the notice Monday in a federal lawsuit that began in 2014. The Ranger reports that the Lockers had accused Encana of contaminating their water and then conspiring to cover up the pollution. Encana had denied the accusations. No terms of the settlement have been revealed, and the parties are required for file a dismissal pleading by Feb. 21. The Pavilion water controversy might be resolved soon in Fremont County. Some property owners said it’s been nearly 20 years since Pavillion’s water was contaminated. 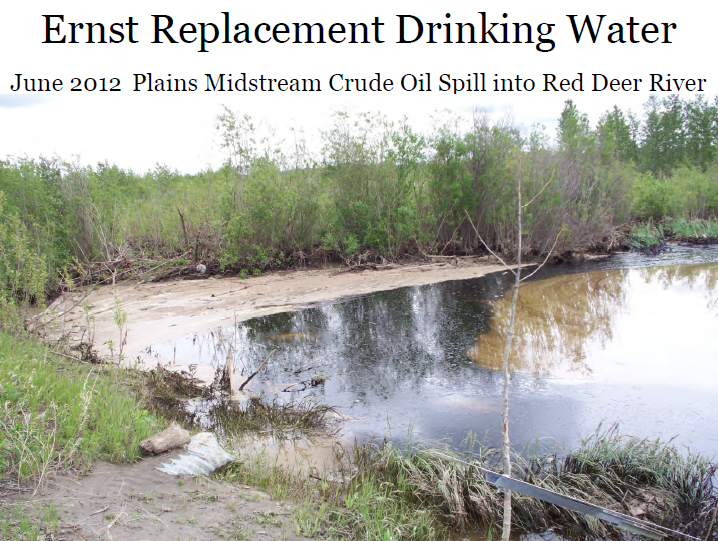 They said it was due to Encana Oil and Gas Company and their operations. Locker added his wife was doing chores around the house when they noticed their water turned completely black with an unpleasant smell. Although it happened years ago, Locker’s son said he still recalls the day. “I still remember when it happens like my daddy. Just turned black and I could taste the chemicals in the water, I’ve worked oil and gas 10 years of my life what happened was not natural in my opinion,” said Eric Locker. Unsure of the cause the family used a filter that seemed like the answer at the time. However, Locker’s wife became sick shortly after. “My wife has suffered some long-term health issues mostly neuropathy some cognitive stuff and she’s not getting better with nerve damage does not heal itself,” shared Locker. Encana researchers have tested the water, but not much has changed for Pavillion residents. Locker concluded he just wants the company to take liability. 2017 11 02: Ernst’s 185 gallon water hauling tank (she purchased herself), Rosebud, Alberta. Ernst drives 45 minutes one way, to get potable water from the Red Deer River that Plains Midstream fouled with a serious sour crude oil spill six years ago. Ernst stores the hauled water in cisterns in her basement (giving up her laundry and storage room), rationing it for household use. The water leaves oily black rings in the cisterns. After the Plains Midstream spill, Ernst separately hauls bottled water for cooking & drinking. 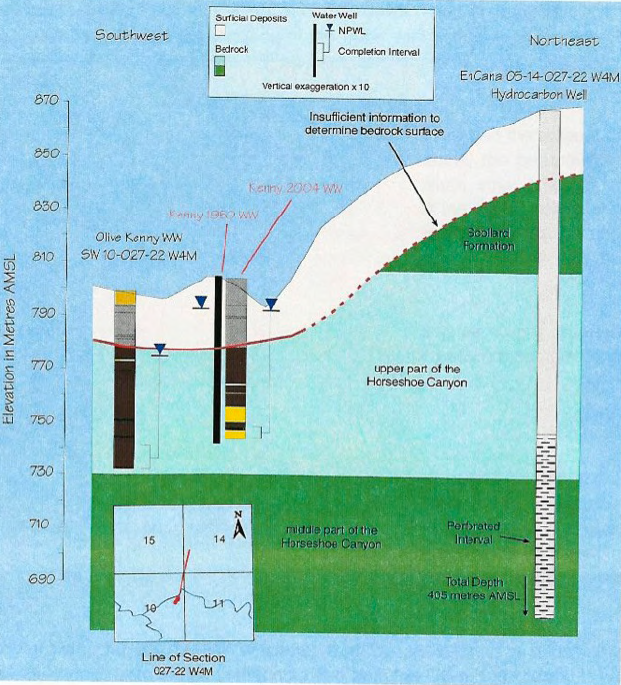 2016 03 31: No Canadian Mainsteam Media Reported on Standford Peer-Reviewed Study Proving Encana Frac’d, Contaminated Aquifers at Pavillion, Wyoming. In Germany, Mainstream Magazine, Der Spiegel, Did! How Corrupt Did Harper Frack Canada? 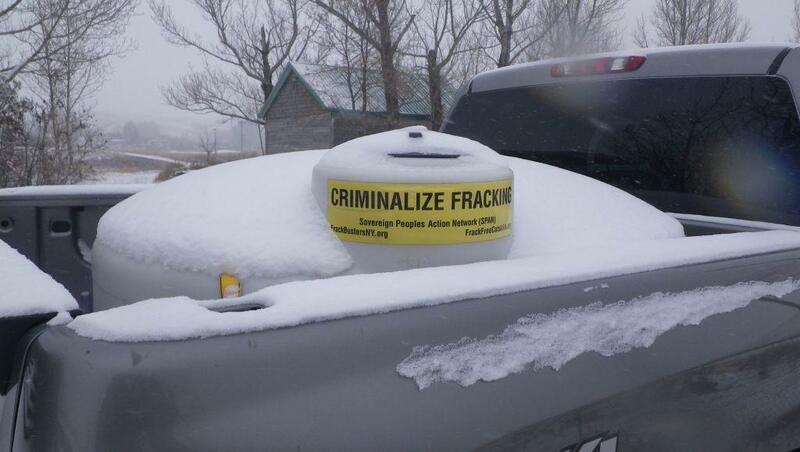 2016 03 30: Another Encana Frac Fraud Bribe? Why is Encana buying “best practices” now, years too late? 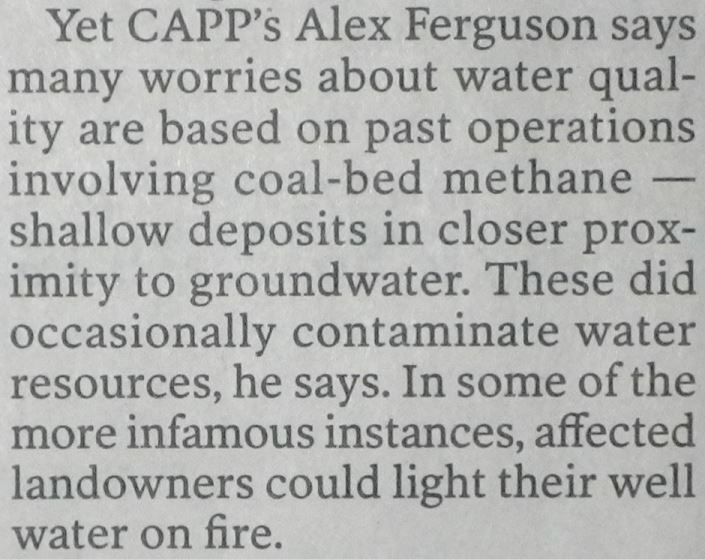 Buy the company out of Pavillion’s frac’d & contaminated aquifers bad news – again? 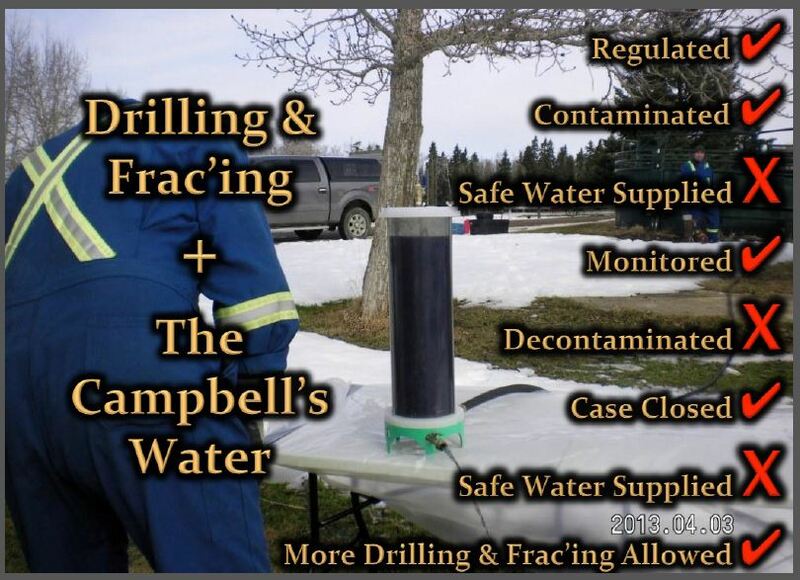 2016 03 30: Why did no Canadian media or blogs, other than The Tyee, report on Digiulio & Jackson’s damning new study confirming Encana frac’d & contaminated drinking water aquifers at Pavillion, Wyoming? 2012 07 10: Pavillion cisterns a go Who wants to live with stale water in cisterns and having to rely on very expensive and unsavory hauled water? Fix the damn damage you’ve done Encana! Do your damn jobs regulators and courts, honestly, appropriately, quickly and integrally. 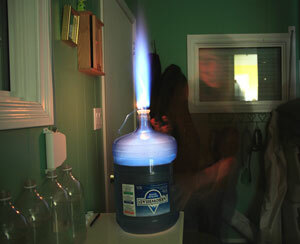 2010 06: Ernst discovers that the Alberta water regulator removed the 1986 historic water well record filed with the regulator for her well and others with gas contaminated water after nearby fracturing, and replaced it with altered records that had the statement “Gas Present: No” removed. 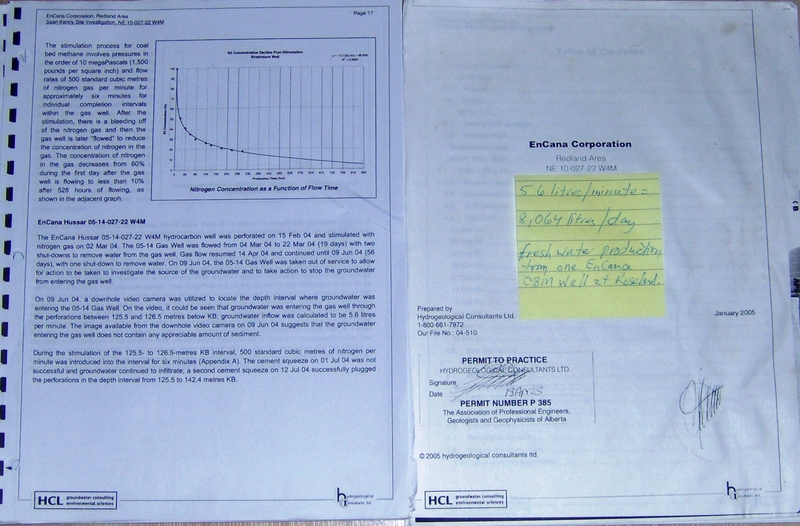 2005 Hydrogeological Report by HCL for Encana documented that the company had broken the law in 2004. The report was sent by Encana to regulators who did nothing with the information but cover-up the crimes and abuse impacted water well owners trying to silence them. 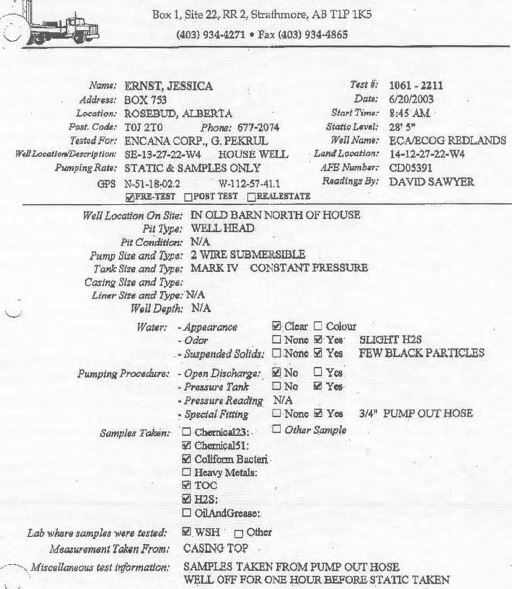 2003: Baseline water well testing done by Encana on the Ernst water well, before the company illegally fractured the aquifers that supply her well, states “Water appearance: Clear” (after Encana’s frac’ing the water pours white because there is so much methane and ethane in it) and does not report any gases in the water. The 2003 tests by Encana compared to regulator tests after Encana frac’d the aquifers show the chromium in Ernst’s water increased by a factor of 45. The regulators never mentioned this, and the expert that reviewed the Ernst data reported the chromium at a concentration 1000 times less than on the lab sheets included in his report. What good are baseline tests or historic records on water wells?